Popular Music Theory - a unique music theory examination syllabus that is designed specifically for students of Popular Music. Regardless of which instrument you play, and whichever style of popular music you like, if you have any interest in learning about the musical foundations of popular music then this syllabus is for you! These examinations offer a comprehensive and structured approach to studying the theory behind playing popular music. Students of popular music can gain internationally recognised qualifications that are equivalent in stature to those available in the classical music education field. The emphasis within this syllabus is upon the musical knowledge and information that you need in order to improve your playing, in all styles of popular music. Past exam papers can provide ideal preparation for your exam. Past papers also provide you with a clear example of the type and format of questions that may appear in the exam. 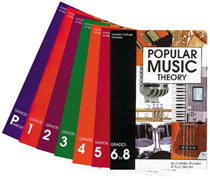 Click here to purchase Popular Music Theory Exam Papers. Worksheets provide you with lots of exercises on every section of the exam (almost 200 questions in the Grade 3 worksheet pack). They provide the ideal preparation for the exam: by studying the worksheets you’ll cover every type of question that may occur in the exam. Click here to purchase Worksheets. Answer Papers show some of the possible answers to questions in a past exam paper. Click here to purchase Answer Papers. As well as helping you pass the LCM exams in popular music theory, this series will help you improve your musicianship (whether or not you intend to take an examination). All topics are covered in a way that is directly relevant to the music you play, with the focus very much upon how to apply theoretical knowledge in a practical music-making context. Click here for more information or to purchase these books.